In the last post I asked if anyone wanted to test a new sock toe shape. The responses were fast, fantastic and fun and I can’t thank you all enough. These are a few of the very first photos back. This was my first time posting an open call for testing a new idea. I knew I needed a variety of feedback because everyone’s knitting experience is different . . . and so are our feet. What if these sock toes only worked for my feet? Wouldn’t that be a bummer. There were over 70 responses in less than a day. I eagerly read every note and answered each knitter as quickly as I could. (My apologies to a few that responded via WordPress vs. the email. There was no way to contact you). Not only did responses come in quickly – unbelievably so did the photos. Some of the first arrived within 48 hours. I really appreciated that because I was waiting on pins and needles. In fact, I simply stared at the inbox for a few minutes, too nervous to read that first critique. Pink tones were very popular. Why test knitting was important. The bottom line is this toe needed testing because I am not an experienced sock knitter. I didn’t know what “real” sock knitters would think. I half expected them to respond that someone else had already done a version of this. On the other hand, they could have said too much detail without much difference so why bother. I also realized that after a somewhat frenzied period of sock designing, I had committed a whole bunch of time knitting socks with this toe. If no-one else liked it I would have to start from scratch. Overwhelmingly the response was positive. Yippee! Dancing around the living room. Several knitters tried these on their favorite guys, who are apparently very picky about toes. The test knitters really stepped up providing feedback that was nicely detailed. Some knitters sent back marked up PDF files and Word documents. There are a number of you who self-confessed that you jumped into knitting without reading everything first. That’s something I need to keep in mind when there are nuances to a technique so it’s not what you’re expecting. Since most of you will not have tested the toe, I will hold the specific comments about the instructions until the sock announcement. Different colors, different gauges too. There’s no need to wait for the sock toe announcement to take advantage of the comment mentioned in 90% of the responses. 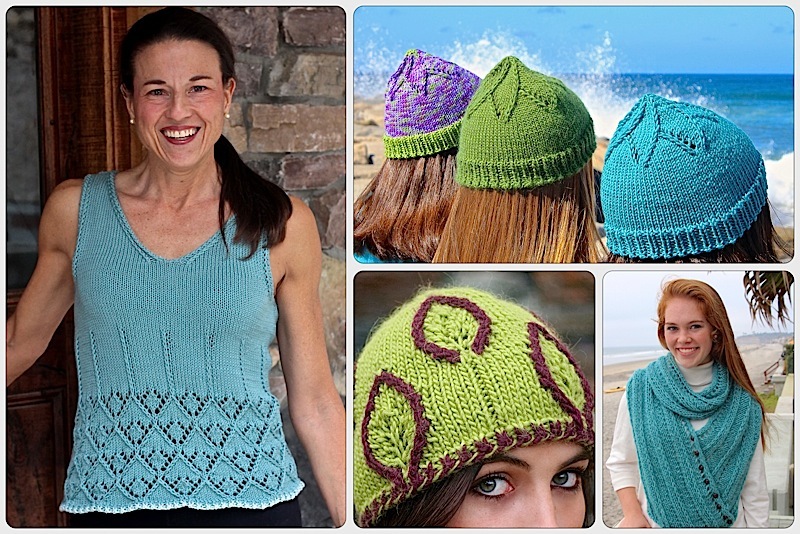 Almost every knitter commented on the Knit 1 Back & Front. This simple change to the standard knit 1 front & back reduces the visibility of the increase in your knitting. And then there are the bright socks! Several knitters kept going and finished their socks. What’s Next? When can I get the Nuanced Toe? I’m updating the Nuanced Toe instructions based on feedback. Then I need to create a table with cast on stitches, number of symmetric and asymmetric increases for different yarn gauges and foot sizes. This way you can use it for all your socks. The prototype tested was for shaped toes but the tables will include an option for shorter toes and a symmetric toe for people who do not want a right and left sock. All my sock patterns will also have different designs on each leg so it will be easy to see which is which but obviously most patterns do not. I also have some knitting to do for the 2nd annual Support Your Local Yarn Shop Day on Saturday, April 27th. Most of your favorite yarn shops will be having special events so I hope you’ll stop by. I’ll be a Jimmy Beans Wool in Reno where I teach. I knit up my prototype for a chevron shawl using Scheepjes cotton/acrylic. It’s perfect for summer months (even though we had snow this weekend here in Tahoe). Determining the right size and stripe sequencing for this 1,000 meter long yarn cake was challenging so I have some tweaks I want to make before writing the pattern. That means I’m knitting another, and quickly. You have to know I wouldn’t knit a chevron shawl without adding something new to the design – right? Of course not. You’ll spot some of my favorite Nuances in here including the Resilient Cast On, Showy Decrease and you probably won’t notice that K1b&f increase we just talked about even though it’s there. Did I mention it’s a 1,000 meters? I’d better get knitting. I need to get this done so I can get back to my socks. Still working on it? I’d still love to hear from you. Love love love this toe!! And I don’t even knit socks! 😊 Lovely to hear that you got so terrific a response, but it’s scarcely surprising. Can’t wait for the new pattern!!! Looking forward to seeing your new pattern. I’ve knit a few pr. of socks, but don’t consider myself an expert yet. My knitting buddy Trisha Cunningham, who submitted a test toe, has urged me to get in touch with you to see if I can still try a sample toe. She loves the toe and said her husband does too… She shared her suggestions with me, but is faithfully biting her tongue and not sharing the directions. I am a dyed in the wool lover of funky socks, but have stuck with top-down patterns because I just haven’t ever been successful doing the heels. I’ve been knitting off and on for 60 years now, but didn’t discover socks until 1996…off the the races since then. I make all of my boot socks, Knit socks for family members and make mine as funky as possible. And even though I’m well versed in magic loop, I still prefer dps. And I’m somewhat of a needle snob I must admit. Bamboo usually stays in a drawer…I wear them out to fast. Until I found the Zing from KnitPro (Knitters Pride is same thing, but more expensive…even with shipping from Australia 4 sets were still less expensive), my favorite dps were rosewoods from Suzanne in Germany. I was blessed to have a LYS here that had the exclusive distribution rights here in the states. When Jean closed her shop, aptly called Needles, I busted the bank and bought every set she had up through size 4, often 3 sets in a size. I’ll attach a pic or so of recent projects. This entry was posted on April 8, 2019 by Laura Cunitz in Other Nuances, Socks, Yarn & Yarn Shops and tagged #LYSDay, Knitting Nuances, Toe Up Socks.